A well rounded, user friendly VPN with a great app. More pricey than some but money well spent in our opinion. VyprVPN is owned by Golden Frog, the company behind Usenet, and they’ve been operating the VPN service for six years which gives it some maturity. All of the VyprVPN software is developed in-house and their flagship Chameleon™ technology uses OpenVPN 256-bit AES encryption which is robust. This coupled with VyprVPN owning and controlling the DNS along with all 60+ global servers running the service, gives VyprVPN full ownership over the securing process. The proprietary nature of the software coupled with the option of their Chameleon™ metadata scrambling technology, is one of the reasons the service is so popular in China, as it is claimed to thwart Chinese censorship and most notably The Great Firewall of China. This scrambling technology is also claimed to prevent bandwidth throttling by Internet Service Providers who are unable to spot when users are streaming services online. Deep packet inspection by anybody able to observe the traffic is also made prohibitively difficult. In the past, some criticisms were leveled at VyprVPN for their policy of retaining data for 30 days, which included the user’s IP address. VyprVPN in 2018 overhauled its logging policy and no longer logs IP addresses nor any other identifying information. The company even subjected itself to a third-party security audit to prove its no-logs claim, something very few VPNs have done. 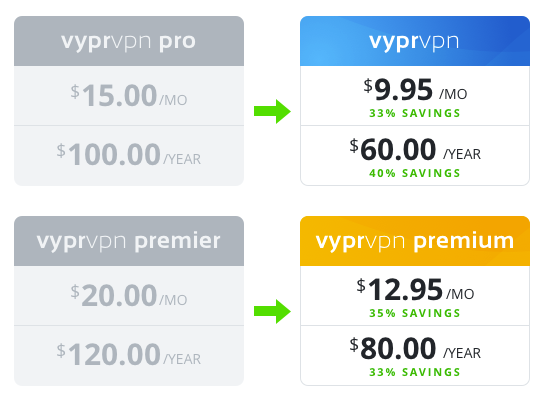 In February 2017, VyprVPN reduced the number of plans from three to two and lowered its prices. Essentially, the old basic plan was thrown out and the other two plans came down in price. The new base tier plan is the same as the old mid-tier « Pro » plan. Update, August 16 2016: VyprVPN are currently offering 50% off the first month here. All come with unlimited data usage. Some of the more robust security features are not available in the basic package which only allows for PPTP. The main difference between the Pro and Premier versions are the allowed simultaneous connections, with Pro allowing two and Premier allowing three. Simultaneous connections are handy if you want to connect from different devices at the same time. There is also a fully featured free three-day trial version. The supported platforms are impressive: Windows 8, 7, Vista, Mac OS X, iOS, Linux and Android. The download takes seconds as the app is very lightweight. The installation wizard is so straightforward as to not merit further comment. Simply hit the log in button, provide your username and password and you’re connected. 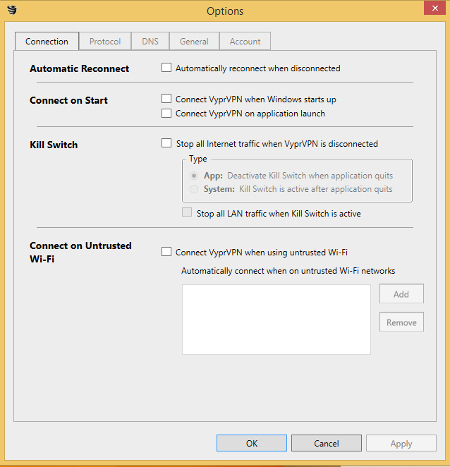 The connection page allows for automatic connection on operating system start up, automatic reconnection when disconnected and a kill switch to stop internet traffic when the VPN is disconnected. This all adds to peace of mind when surfing anonymously, as it is all too common with some VPNs to become disconnected and the user not realize, revealing their IP. OpenVPN 160-bit or 256-bit, L2TP/IPSEC 256-bit, PPTP 128-bit and the proprietary Chameleon™ 256-bit. The DNS page is set to VyprVPN by default but does allow for 3rd party DNS servers. The DNS leak prevention is also selected by default and as this has been an issue with VPNs in the past, I decided to check the veracity of this through dnsleaktest.com, which confirmed there was no leakage. I did this test after selecting the Vietnam server, another good feature in the app allowing you to select your geolocation. The General page is as you would expect with: desktop notifications, sound and language options. 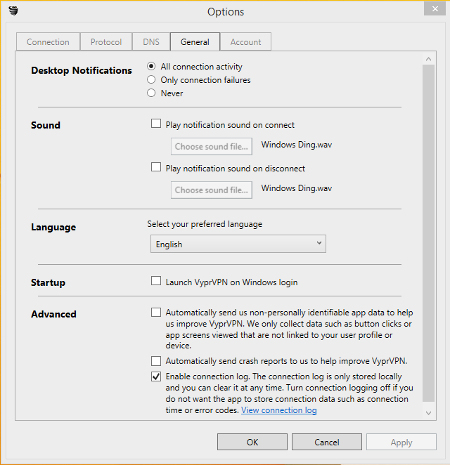 Plus the option to launch VyprVPN on login. You can also disable the local connection log. The account page includes information on account name, type, data usage, update check, version, etc. The VyprVPn website gives you your own account page within which you can access additional services at no extra cost. The first additional service is Dump Truck, which is a Dropbox style secure online storage providing 5GB of space. Again there are nice apps to download for various operating system platforms for syncing. The second additional service is Cypher, an encrypted messaging app for Android and iOS. 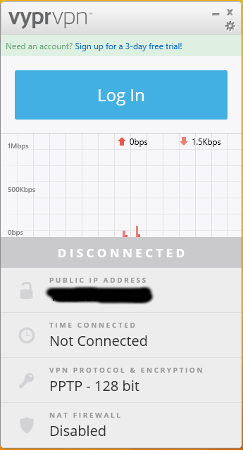 VyprVPN claims to be the fastest in the world and I don’t know if that’s true, but a check on download/upload speeds compared with my Internet connection without VPN, shows only slight speed degradation, which is to be expected, especially when selecting servers geographically distant. A slick, mature VPN, with a very user friendly app for most platforms. Good level of control over configuration and encryption protocols. Pricing is on the higher scale of average for a VPN and I was disappointed to note only credit card and Paypal are accepted for payment; no virtual currencies such as Bitcoin. Torrenting is still frowned upon but the company doesn’t log any of your online activity or identifiers. Overall, I was impressed with this VPN.